Devon, a spunky five year old from Truckee, California is our Rippin’ Rider tester for Rossignol skis and bindings (the Cobra Junior model). Devon gets out on the slopes of Northstar-at-Tahoe and rips it up. Here’s what she and her mom have to say about Rossi. Functionality of product: The product does what it is supposed to do. But, the bindings are very stiff and require adult assistance both in and out. (Ed. Note: we also heard this back from another light weight tester whose daughter had to sit way back and push hard to release. This was not a problem for heavier testers.) The brakes attach more securely than most, which makes for easier carrying. 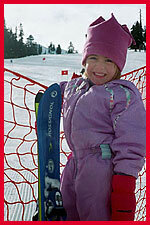 Special features: The glow-green bases are excellent for little ones in powder (ie: helping to find the released ski). This has been very important more than once – a five year old has little idea how to go about putting themselves back together as it is! How is it made? : The blue top coat is still looking great after at least 10 days of skiing, thrashing, dropping, and dragging about – all the things that a 5 – year old does to their skis! Where we used the product: We have skied primarily at Northstar. Devon is having fun there on the special trails – Bobsled especially, but also Meander and the other Paw Park trail. She has taken to the trees in a big way since the switch to the Rossignol shaped ski. She definitely has more stability in the crud. Cool Factor: The glow-green bases are excellent for the little ones. They all seem to notice this feature, and besides, they match her big brothers’! Editor note: We caught a glimpse of Devon skiing at a Kidznsnow Day at Soda Springs. She was rippin’ up the intermediate terrain and carving some nice wedge/parallel turns. She motored on those Rossi’s. More on Rossignol Rippin’ Rider Preview here .